This place was recommended by friends at Khao Man Gai NY and was one of our first stops upon arriving in Thailand. 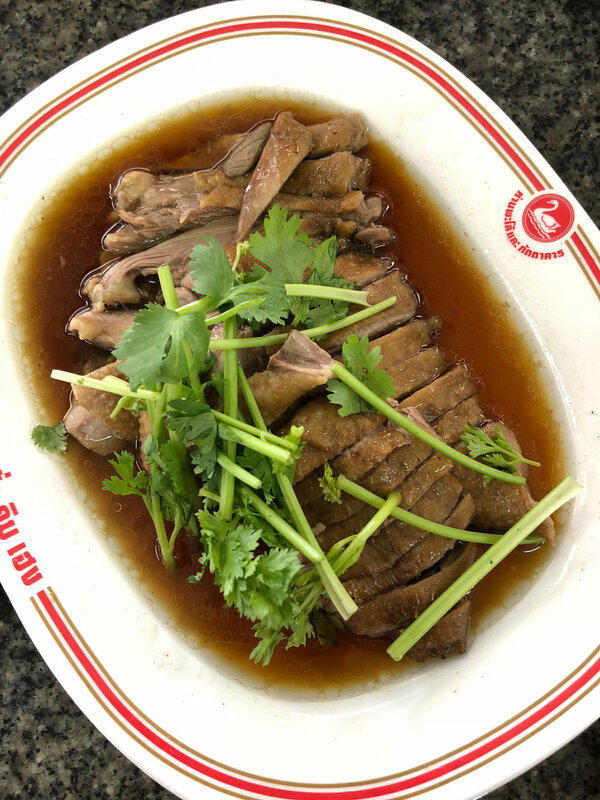 Located around 15-20 minutes outside Bangkok center, Chua Kim Heng is known for its braised goose which is served with a delicious vinegar garlic sauce. 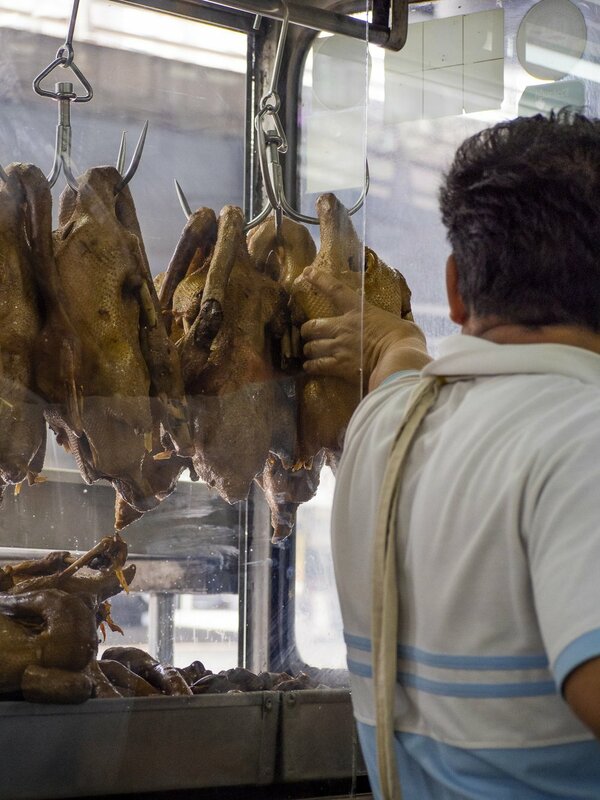 When you order, the butchers grab one of the hanging geese and use these huge cleavers to chop up the meat. The khao man gai, pork bun, and bitter melon soup are also very good. Wat Pho is one Bangkok's largest and oldest temple complexes. It's famous for its massive 150 foot long reclining gold Buddha statue, but there are a lot of interesting shrines, pavilions, and buildings to see within its walls. Built in 1782, the Grand Palace was the official residence of the Thai King and the seat of the Royal government. Though it is no longer the home of the King, it's still used for ceremonies and important events. Because it's considered once of the most sacred and spiritual sites in Thailand, the dress code at the Grand Palace is very strict so make sure you're prepared and dressed appropriately. According to Wikipedia, the Chatuchak Weekend Market attracts over 200,000-300,000 visitors on a daily basis. It most certainly feels that way. Though we were initially wary to visit because it sounded like a sweaty and overcrowded experience, Chatuchak Weekend Market was actually quite fun. It's certainly packed with people, but there's a diversity of stores and lots of different things to eat and sample. Jim Thompson is an American businessman, former architect, and retired army officer who, through his marketing prowess, helped revitalize the Thai silk industry in the 1950's. Now a museum that showcases his large art and antiques collection, the Jim Thompson House was designed and assembled by the ex-architect himself using old pieces of traditional Thai country homes. The House and the tour of the property are a bit surreal. The building sits on half an acre of lushly landscaped property in the middle of bustling Bangkok. It's a special place and definitely worth a visit. Eating an oyster a dish from a street-side restaurant in Thailand seems like a terrible idea. But the crispy oyster omelette at Nai Mong Hoy Tod was one of our favorite and most memorable dishes during our entire trip (though I'm sure that the fact that we didn't get sick from it adds to its value). The dish feels like a distant relative to the Korean pancake and is absolutely delicious. Order the large size--we didn't and we regret it everyday. I'd say that Bangkok is not the most pedestrian friendly city. 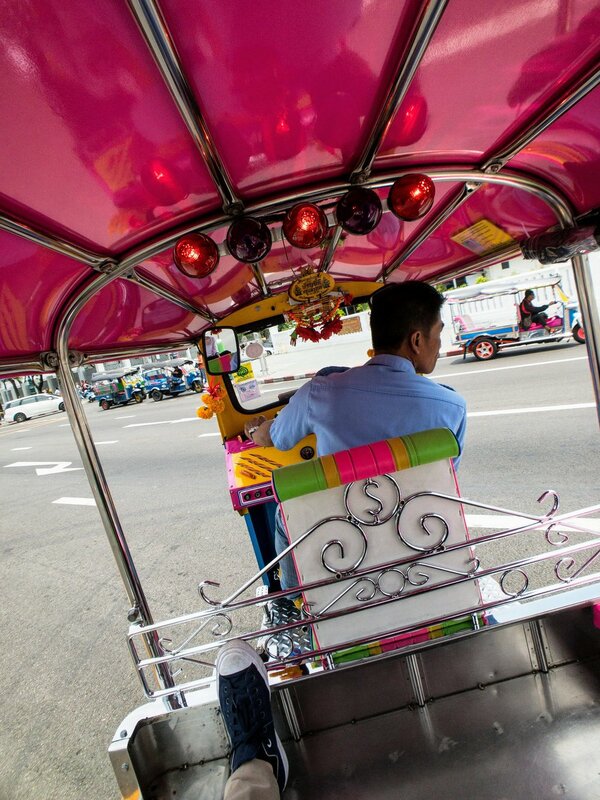 The easiest way to get around Bangkok is by train or by taxi. Uber had just shut down operations in Thailand a week before we arrived, but ride hailing rival Grab is pretty popular. It's also pretty easy to get a cab from the street, but many of the drivers don't speak or read English so be sure to get the address of your destination in Thai. We only took two tuk tuk rides during our trip because the crazy traffic, pollution, and heat during this time of year made the ride very unpleasant. It was quite the ride though--like riding a roller coaster but with no safety harness and no tracks. Most of our pre-trip planning was spent trying to figure out at which hotels to stay. All the planning paid off because we really loved all of our hotels, including the COMO Metropolitan Bangkok, located in the Silom business district. The rooms are minimal but comfortable, and the breakfast buffet at the glow restaurant was surprisingly good. The one Michelin star restaurant Nahm is also on the ground floor.